PLAYOFF HEROES: Just where does Royer’s brace and then some stack up in Red Bulls’ history? In the Red Bulls’ 3-0 victory over Columbus Crew SC last Sunday, Daniel Royer scored twice and set up a third goal in one of the great playoff performances in the team’s 23-year history. Just how does that stack up against some other memorable games and moments? He had a hand in all three Red Bulls goals. He struck for the first one on a breakaway through the middle of the Dynamo defense in the 25th minute. His right-wing cross hit the hand of former MetroStars midfielder Rico Clark and Juan Pablo Angel converted the ensuing penalty kick in the 36th minute. Richards put an exclamation point on the upset with a superb 65-yard run down the right flank before he sent a short pass to a charging John Wolyniec in front of the net and the Staten Island native tapped in his first playoff goal in the 81st minute. The Baldwin, L.I. native, with only four MLS games under his belt, was credited with five saves in the victory over Houston, although it seemed that he made double the amount. He denied Brian Ching on a header in the 59th minute. Stuart Holden fired a 25-yard effort that was knocked by Cepero in the 78th minute. A minute later, Cepero made the save of the game when he made a kick save on Holden’s 15-yard shot. Until the Red Bulls win MLS Cup, this will remain the greatest achievement in team playoff history. That’s a back-up goalkeeper — someone from another organization — backstopped the team when it was known as the MetroStars to its first appearance in the league semifinals. For the record, Grafer, who had been playing with the Long Island Rough Riders (A-League at that time), dispatched the Dallas Burn in two successive wins (both 2-1 results), although he will be the first to admit he had some help. Grafer’s reward for doing what has become a legendary achievement? Sitting the bench when regular Michael Ammann came back to play. He scored a goal in both games against Houston, giving the Red Bulls a 1-0 lead in the 48th minute at Giants Stadium Nov. 1 before the Dynamo equalized late in the match. His penalty kick in the second leg, a 3-0 triumph, was a back breaker. If anyone had any doubt that Mathis owned the Dallas Burn, they just needed to take a look at the 2000 MLS season. He scored a record five goals against Texas side. In the playoffs, he scored three goals, in a pair of 2-1 wins, including two in the second game at the Cotton Bowl Sept. 20. 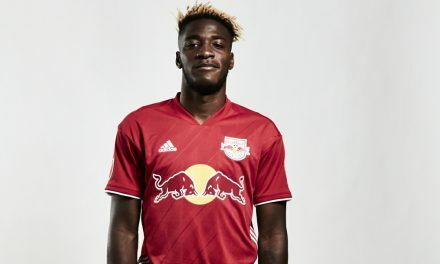 Royer, whose header set up Alex Muyl’s first-half goal, took matter into his own hands, or rather his feet, in the 73rd minute against Columbus Crew SC at Red Bull Arena. He finished off a play in which the Red Bulls completed at least six consecutive passes before slotting the ball past goalkeeper Zack Steffen for a 2-0 advantage. The RBA faithful barely had time celebrating Royer’s goal before the Austrian struck again, this time moving from lef to the middle of the penalty arc before powering a shot over the U.S. international goal for an important third goal. Valencia struck twice in the decisive Game 3 of the semifinals on in the 32nd and 36th minutes, but it wasn’t enough. His teammates thought that Valencia should have had a third goal late in the match, but it was ruled offside. The bottom line was a 3-2 victory for the Chicago Fire. The Estonian international may not have been flashy, but he continued to prove his worth as he scored the first goal in the 61st minute of the 2-0 victory over FC Dallas in the wildcard match, converting a short pass from Mehdi Ballouchy. With Mathis ailing with a season-ending knee injury and Valencia struggling to find his form, the onus for goal-scoring fell on the shoulders of Faria, who did pretty well. His most memorable playoff game came against the LA Galaxy, the MetroStars’ lone home game in the opening round. The Brazilian-born forward scored the equalizer in the 72nd minute and added an insurance goal in the 80th. With the Red Bulls trailing the Columbus Crew, 1-1, in the MLS Cup. Woly equalized in the 51st minute. thanks to a nifty move by Richards through the right side of the penalty area. He slipped a short pass to Wolyniec, who sent a shot from the right side of his right foot from five yards past goalkeeper Will Hesmer and into the net for his second playoff goal. The deadlock, however, lasted less than two minutes as the Crew scored the eventual game-winner in what turned into a 3-1 victory. It was the only goal a Red Bull has scored in an MLS final. Robles recorded back-to-back 1-0 clean sheets in the Eastern Conference semifinal series win over D.C. United. While not tested in the first leg as United failed to place a shot on goal, Robles was more than able in the second leg. In many respects Robles represented the Red Bulls’ defense — team and backline — which shut down D.C. so well. McCarty tallied one of the most memorable playoff goals in franchise history against D.C. in the Eastern Conference semifinals. Sacha Kljestan created the winning goal, sending in a 30-yard free kick from the right side to McCarty, who beat his marker at the far post and heading the ball past goalkeeper Bill Hamid from four yards in the 72nd minute. The Red Bulls went on to win the game, 1-0, and the series. The Red Bulls were already leading the series late in the second leg against United. Two minutes into stoppage time at Red Bull Arena, BWP sealed the match and series as he converted a right-wing feed from second-half sub Gonzalo Veron into an empty net. It certainly gave many Red Bulls supporters much relief. Despite playing with an injured groin muscle, Lindpere acquitted himself quite well for 89 minutes in the 1-0 win over the San Jose Earthquakes in the Eastern Conference semifinals first leg. And to score the lone goal in the 55th minute, to boot, to give the Red Bulls a one-goal lead entering Thursday’s second leg. The Frenchman did his best to keep the MetroStars’ playoff hopes afloat in the first round by assisting on Amado Guevara’s goal in the first leg of the aggregate-goals series in the 34th minute and scoring the MetroStars’ first goal in the second leg before Gillette Stadium collapsed on them on one of the team’s greatest game meltdowns as they watched their late 2-0 lead be transformed into a 3-2 loss to the New England Revolution. His 75th minute goal equalized the game at 2-2 and forced a shootout against D.C. United in the very first playoff game in MetroStars history. He also converted one of six shootout goals to secure a victory. In that first playoff encounter, Meola made seven saves in regulation and two more in the shootout — on Raul Diaz Arce and another on Richie Williams. Two other United players — Clint Peay and Eddie Pope — shot wide right and goalkeeper Jeff Causey (a shootout specialist who replaced starter Mark Simpson in the 90th minute) placed his attempt wide left. Vermes etched his name into MetroStars history by converting the winning shootout goal in a marathon tie-breaker (6-5 after a 2-2 draw) in the very first playoff game in club history, a win over D.C. United at Giants Stadium that Sept. 24. Vermes’ winning kick, however, wasn’t without controversy. United coach Bruce Arena claimed that Vermes had forfeited his attempt because he was ineligible to take a kick as the 11th shooter after asking to be moved from the eighth spot to a later position due to a leg injury. United filed a protest with the league, but it was rejected about an hour after the game. “The rule is that the 11 players that finished the game on the field have to shoot, and I was the 11th man,” Vermes told the New York Times. 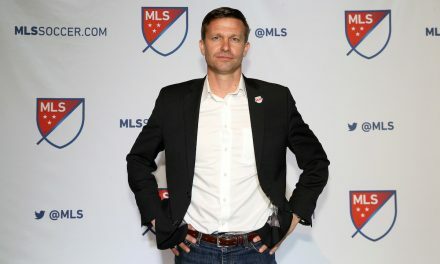 Commissioner Doug Logan’s take: “The fundamental question we were looking for was whether the change in sequence gave an unfair advantage to the MetroStars, and it’s my opinion it did not.” D.C., incidentally, won the next two games and eventually captured the MLS Cup. 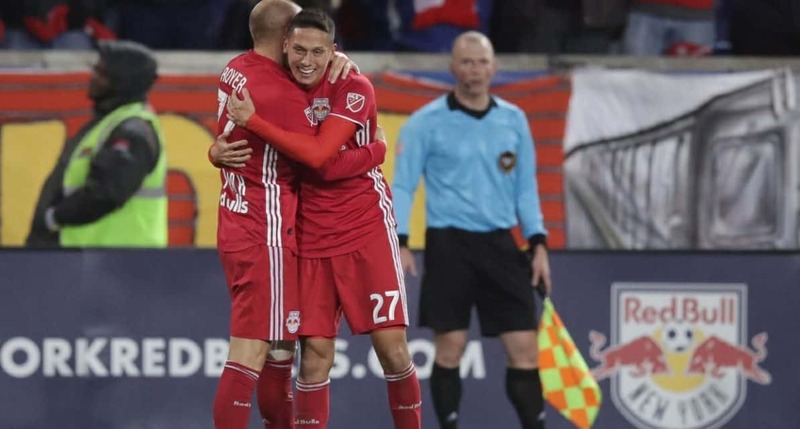 Continuing his bombastic regular-season in which he tallied a league-record tying 27 goals, BWP struck for the first goal to lead the Red Bulls to a 2-0 triumph over D.C. United in the opening leg of the Eastern Conference series at Red Bull Arena. He scored in the 39th minute. The versatile French player scored in both legs as the Red Bulls eliminated D.C. in a 2-1 defeat after adding an insurance goal in the 73rd minute that 2-0 victory in the opening leg. In the second leg with United leading 1-0 at RFK Stadium, Luyindula, off a Thierry Henry feed, connected in the 57th minute to put the final nail in the proverbial coffin as the Red Bulls finally won a playoff series against their Atlantic Cup rivals. The 1998 World Cup winner set up all three goals for the Red Bulls in that conference series win over D.C. Enough said. A much-maligned reserve by the media and fans, Ballouchy came on for an injured Dax McCarty in the 59th minute of the 2-0 wildcard win over FC Dallas on Oct. 26. Two minutes later, he made an impact, sending Lindpere a short pass from the right wing for the first goal of the match at Pizza Hut Park. The veteran German keeper caught, parried or knocked away everything FC Dallas sent his way in that wildcard win in Frisco, Texas Oct. 26. He was as solid as a rock as the Red Bulls won their fourth consecutive road playoff match. A relatively quiet person who led his playing speak for him, Chung struck for the first goal in the 2-0 win over the Dallas Burn at Giants Stadium, which clinched the quarterfinal series for the MetroStars. Chung scored an unassisted goal in the 40th minute. The former French international tallied his first playoff goal to put an exclamation point eight minutes into stoppage time on a counterattack in the 2-0 win at FC Dallas Oct. 26. Seconds later, the game was called and the Red Bulls had a win. Had the MetroStars won this encounter with the LA Galaxy, this accomplishment would have been placed much higher in the pecking order. As it is, two goals in the 4-2 loss was pretty damn good for a midfielder. He connected in the 49th minute and added another 11 minutes later. Before he accomplished the feat against Belgium in the 2014 World Cup, Howard made a team playoff-record 16 saves in the 4-2 loss to the Galaxy, which eliminated the MetroStars from the playoffs at the Rose Bowl. 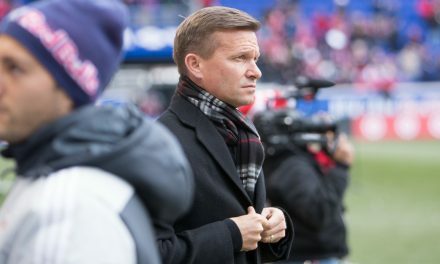 After the Red Bulls were blanked by D.C. United in the opening leg, 1-0, Altidore struck in the 70th minute to equalize the total goals series at 1-1. But Christian Gomez found the back of the net four minutes from time to break the Red Bulls hearts for the countless time.